Editor’s Note: What a savvy news editor Starship Earth is! This post-Christmas report if full of the kind of news you want to hear about our world and it’s developing FREEDOM which we all crave. Ah, yes…it appears no report of these times is complete without a nod to tactics taken by the forces of negativity on our Earth to retain their control…but it ain’t workin’ no more! Natasha V shared the image above from an unknown location in her recent video update. Someone might recognize the squadron emblem on the hangar. I forgot to say that the odd picture posted on HRCs Twitter account, and also an odd one from Obama just might signal the fact they are not available to post on their own accounts…. hint hint. It’s very interesting when the military are acknowledging QAnon, isn’t it… all in dress whites? Maybe those are just the bakers, lol. Or perhaps Q actually is a legitimate military intelligence group. They certainly get a lot of bad press from the treasonous media and trolls, and that speaks volumes—but of course it could all be a ruse. 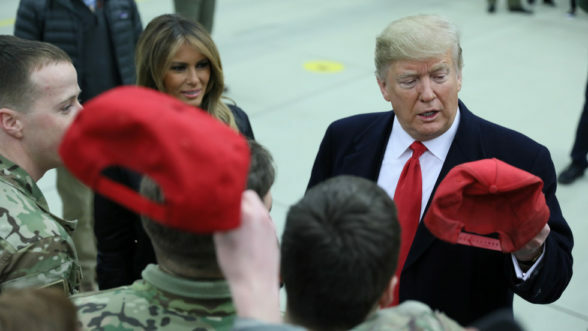 Trump made the news again when he and the first lady slunk off to Iraq to visit the troops, followed by a stop in Germany on their way home. And I thought they were home with their family. That’s a dutiful couple, and of course the secret service and other staff had to go, as well. For anyone needing an infusion of positivity in light of the dour attitudes fostered by the lamestream media and their negative spin… BCP has a great update. BRILLIANT! TRUMP WINS BIG FOR CHRISTMAS WHILE DESTROYING HIS OPPOSITION AT THE SAME TIME! A recent and still ongoing poll showed these results earlier today. Do you think Donald Trump is qualified to be the President of the United States of America? Breakdown: Do you support President Trump? Our REAL weather men, like Mike Morales, tell us “they” have been spraying the entire planet thickly with chemtrails—except over Israel. Seriously. We have frigid temps here in the Valley of the Sun (by our standards) and it was a chilly walk for bare hands this morning. Massive waves continue to pound the coasts of multiple countries, there’s flooding again in Texas, and warnings for tornadoes and blizzards. Crazy! And we have Yellow Vest protests in Kelowna, British Columbia, Canada! These folks know what they’re talking about, too. No Trudeau! “Trudocchio” I love it. I hear lots of horns honking in enthusiastic support. Go Canada! Take your government back. If Utsava resonates, she has another update for December 26.